One Marine's Journey To 'Hell And Back Again' Photojournalist Danfung Dennis embedded with the U.S. Marines in Afghanistan. His documentary, Hell and Back Again, has been nominated for an Academy Award. The film follows Sgt. Nathan Harris, who is wounded in battle and struggles to transition back into civilian life. Hell and Back Again focuses on Sgt. 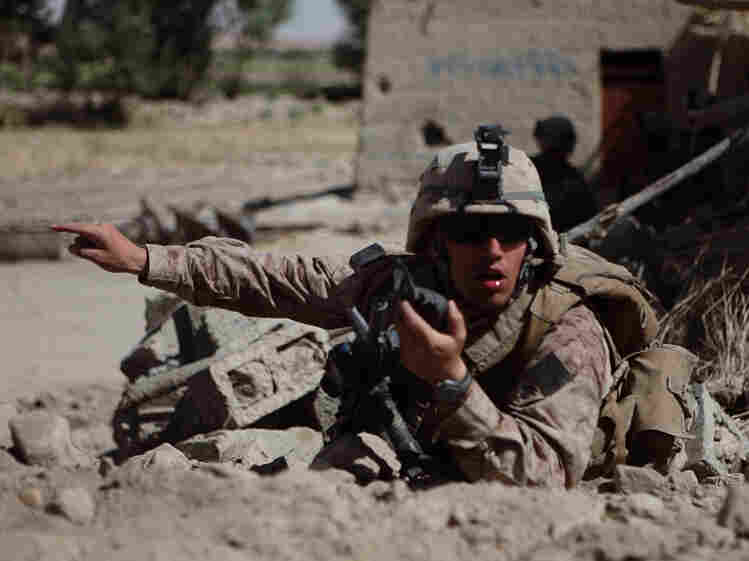 Nathan Harris' life on the battlefield in Afghanistan and at home in North Carolina. Photojournalist Danfung Dennis has captured the brutalities of the war in Afghanistan for The New York Times, Newsweek, The Guardian and The Washington Post. But as the war stretched on, he started to feel that the images were losing their impact. "After so many years of war," he tells NPR's Neal Conan, "society's become numb to pictures of conflict, and so I felt like I had to move into a new medium to try to shake people from their indifference." Dennis embedded with the U.S. Marines Echo Company in Afghanistan and created the documentary Hell and Back Again. The film, which was nominated for the 2012 Academy Award for Best Documentary Feature, follows the story of a wounded Marine. Sgt. Nathan Harris' was injured by fire from a Taliban machine gun and then struggles to transition back to life in North Carolina. After so many years of war, society's become numb to pictures of conflict, and so I felt like I had to move into a new medium to try to shake people from their indifference. Dennis says he first met Harris on one of the worst days of fighting Dennis had experienced. One Marine had been killed the day before, a dozen had collapsed from exhaustion, and water was running low. "That's when a Marine handed me his bottle of water, and this was Sgt. Nathan Harris. And I could tell he was this exceptional leader, completely fearless," says Dennis. "And so I followed his platoon as they pushed further into this stronghold." Dennis says he didn't realize that Harris would be the film's central character until about seven months into filming. After Harris was injured, Dennis essentially lived with Harris and his wife, Ashley, during his recovery. The story shifted to capture the challenges of returning from war, and Dennis says Harris openly and honestly shared his life with the camera. "I think it's because we went through such traumatic experiences in Afghanistan that he trusted me, and I trusted him. He showed me the darker aspects of coming home, of being in the armed ... forces. We sort of went through that same struggle of coming back and trying to readjust," Dennis says. Harris was able to stay on as an active-duty marine in the Wounded Warrior Regiment in Camp Lejeune, N.C. He continues to undergo physical therapy to regain the use of his legs. Harris, who joined the Marines at 18, continues to cope with the realization that he won't return to Afghanistan in combat. "In a combat zone ... it's simple. You sleep, walk, fight — do it again the next day," says Dennis. "And then when you get back and you're trying to deal with complex relationships, doing your taxes, just the everyday things of life, that can almost be more difficult than being out in the field."